It's hard to believe that a blower door test could feel...if not routine, than not like a really big deal on just our third Passive project. I mean, that 0.6ACH50 target we learned about in Certified Passive House Consultant sounded so difficult-- more than ten times tighter than code-required! !--but, it turns out, with a builder like Evolutionary Home Builders and a sound airtightness strategy, it requires rigor but is predictably achievable. So for this blower door test, our rater, Jason LaFleur of EcoAchievers, suggested we put the call out to our Passive House Alliance (Chicago chapter) and USGBC-IL to see who would like to come witness it. And we had a great turnout! ...for a good low reading--129 cfm! So, what does that reading of 129cfm mean? Fundamentally, when Lindsey started the fan, she depressurized the house--sucking air out out it--so the leakage rate is telling us, when we get the pressure to the 50 Pascals baseline, that the sum of all leaks we have in the building envelope--all the windows, doors, plumbing and electrical penetrations, etc.--only allow 129 cfm to flow through them. We calculate Air Changes per hour (that's the ACH) by multiplying our cfm reading by 60 to get cubic feet per hour, then dividing that by the house volume (18,991 cu. ft.) to get 0.41ACH50. Comfortably below the "old" 0.6ACH50 requirement. But with PHIUS+ we have a new way of expressing leakage, which is cfm of leakage per square foot of thermal envelope area. Simpler calculation: 129cfm/5664s.f. = 0.023. The PHIUS+ requirement is 0.05, so we're less than half of that--a very good result. Bravo Evolutionary Home Builders, and thanks to EcoAchievers for the testing! Blueskin WRB with furring strips for siding. Note the red at window bucks--that's Prosoco fluid-applied air barrier, the primary air barrier on the project. AirRenew gypsum board throughout--a good choice for air quality. From the Field: new projects arising! Capped out before the cold hit! That's it for now--more to come as these get enclosed and finished! As I prepare to head out of town for my favorite holiday, I've been thinking about gratitude. I have to credit my new-found meditation practice for an increased sense of appreciation of those around me and for my work. I've always had a sense of "mission" with my work--to do good for the environment and to create beauty in appreciation of nature wherever possible. 2015 has been a great year for TBDA, and I consider myself incredibly fortunate to be able to practice architecture in line with that mission. And I realize that it is all brought into existence first and foremost by my clients, and made possible by my employees, consultants, and of course, by the support of my family. So, to all of you, my deepest gratitude...and Happy Thanksgiving! The excitement has been building as the house nears completion. As the cleaning crew wrapped up on Thursday, we saw all the tile, countertops, flooring, and built ins in their finished state at last. The owners have been doing low-voltage wiring (Paul is a pro--technical director at Fuse Technical Group), and have been learning the details of mechanical equipment use, cabinet adjustments, appliances, etc. It's been a beautiful Spring. Landscaping starts Monday! Occasionally I am asked why I named my domain "drawingonplace." The reason behind it is at the core of my aspirations in architecture, so I thought I'd take a shot at explaining it, and then illustrate the idea as I begin to follow our next project on the blog. 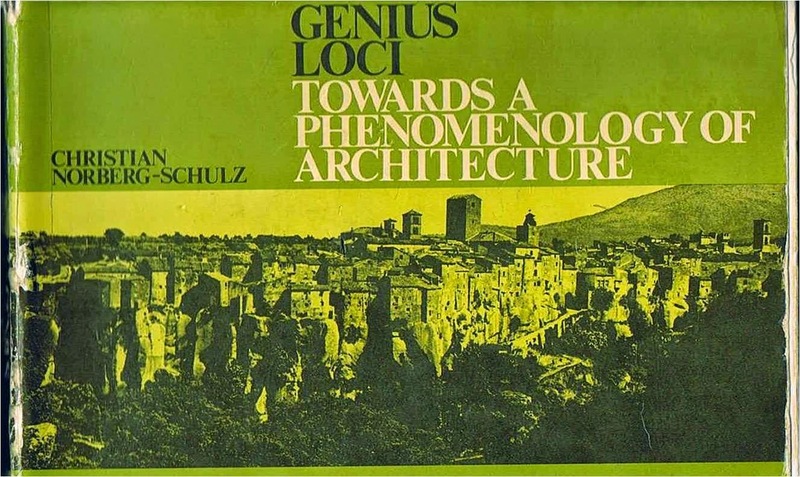 I was introduced to the concept of Place by the architectural theorist Christian Norberg-Schulz in his book Genius Loci (Rizzoli, 1979). Beyond mere location, he uses Place to mean qualitative environmental character or "atmosphere," made up of concrete phenomena like texture (material), density (scale), color, and light. It was a refreshingly concrete idea for me against the abstract notions of Deconstruction that were the rage when I was in grad school. We have all experienced places that have exceptional character--great cities, natural settings, neighborhoods, rooms; what Schulz shows is that we can identify why these places are exceptional, and use that knowledge as designers. But Schulz also takes it a step further to connect the idea of Place to something deeper, which is our connection to landscape and the way we as humans settle in different environments. Desert, forest, prairie, savanna, have traditionally called up powerfully different responses (he uses Khartoum, Prague, Rome, and Chicago as examples), though, sadly, sensitivity to landscape is usually literally and figuratively bulldozed these days. All of this was simmering in my mind when I was ready to start my own firm in 2006. I knew I wanted to pursue sustainability, but I did not want to sacrifice design for efficiency, or sacrifice efficiency for vanity. So one day on vacation in Charlevoix, Michigan, I was standing and looking at one of Earl Young's Boulder Park Houses, and what was evident to me was Young's love of his place--he made it real in those houses. And the light went on for me: if you really connect a building to its environment in a sensitive way, you are well on the way to both beauty and sustainability; you will be drawing on the native resources (local materials, light, solar gain, ground forms, views), and establishing a sense of place in the process. The best modern building would be like the best traditional building in that it would fit and glorify its locality--I like to call it "resonating" with its surroundings--but it would go beyond appearance to integrate the best in efficiency and technology a la Passive House. So that's the big idea--"drawing on place" means creating a quality of space-experience in vital balance with its environment; it means "drawing on" the positive, healthy qualities of a place to design a building/landscape that amplifies those qualities while establishing its own character. I often reflect on the Daoist concept of Yin and Yang, the dynamic balance of opposing forces. Our work can be seen using that analogy: if the setting is the Yin, our building is the Yang: the best design will be one that brings a dynamic vitality to the whole. Now that rough mechanicals are in and the air barrier system has been successfully tested, finishes are going in.These will get a lot more exciting pretty soon as tile, wood trim and accents, cabinetry and countertops, etc. get installed, but that will be next. This stage of construction is where a lot of toxicity can enter a project, but we and Evolutionary Home Builders (contractor) are vigilant about keeping interiors healthy. Adhesives, caulks, primers and paints, and floor finish have been selected to minimize toxicity: low VOC is not enough: we look for zero VOC, non-toxic, GreenGaurd Certified products, and of course no added urea formaldehyde. At the end of construction we hire a third party to test the air for aldehydes and VOCs, so we are especially motivated to keep it clean. It makes such a difference--this jobsite has never had that awful toxic "new car" smell you get on so many construction sites. We're very grateful for the vigilance EHB brings to the project. There is no alternative to sustainability. This blog is a way to share my experiences, provide links, and ask the questions that will help us achieve the goal of sustainable buildings and communities. In 2006 I set up my architecture firm to pursue my long-standing desire to create meaningful, sustainable places. In 2009 I learned about the Passive House concept, and realized that it provides a tool for designing site-specific, ultra low-energy buildings...which happen to be very comfortable and have great indoor air quality. In 2010 we completed construction on our first house designed with Passive House principles, and in 2012 completed the first Certified Passive House in the Chicago area. This blog is a chance for me to share what we're learning and to let people know that ultra-efficiency is within our grasp today, both technically and financially.